Armando Gomez, a moderate Democrat, has found himself in the crosshairs of union-sponsored attacks. State Assembly candidate, Milpitas Councilman and San Jose budget director Armando Gomez has found himself the target of an increasing number of union-funded hit pieces. The mailers—sent out earlier this month by "Opportunity PAC"—paint him as a greedy bureaucrat, having culled a $1.2 million compensation on the taxpayer’s dime while calling for reduced retirement for public workers. “The city increased [his pension] by more than 150 percent since 2007, bringing his pay and benefits to more than $1.2 million over seven years,” states a mailer paid for by the PAC, which has received $715,000 in the last 13 months from a variety of other independent committees, including PACs for teachers, health care workers and AFSCME. Only it wasn’t Gomez' pension that increased. It was the cost to the public. That’s why Gomez, who’s running against four other candidates in the 25th District, supported Mayor Chuck Reed’s pension reforms in the first place. And that $1.2 million? That’s total compensation over a seven-year stretch. 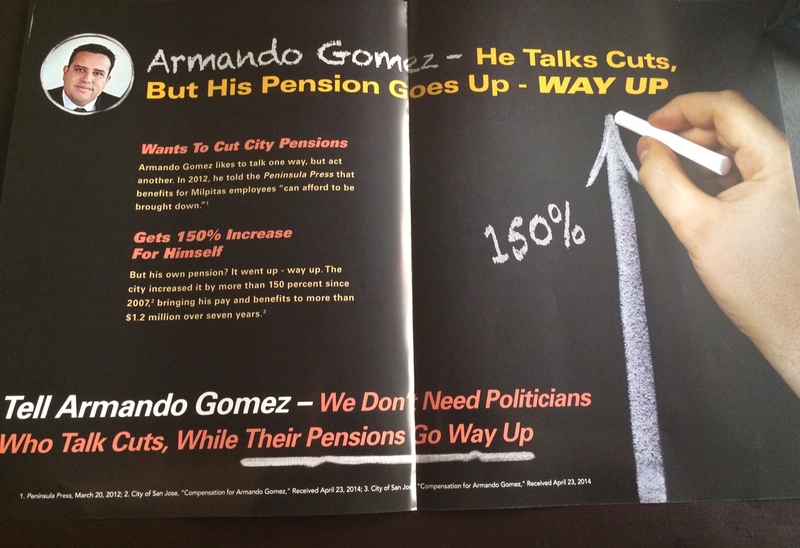 This is one of several attack ads sent out against State Assembly candidate Armando Gomez. To date, Opportunity PAC has spent $219,918 opposing Gomez in a race that also features: San Jose Councilman Kansen Chu, community college trustee Teresa Cox, former Fremont police chief Craig Steckler and a lone Republican, Bob Brunton. None have been targeted by other committees to the degree of Gomez, who was even compared in one mailer to George H.W. Bush, Bush Jr. and Richard Nixon. Gomez actually takes home $111,000 a year as one of Reed’s budget directors, a modest salary relative to others in his rank and lower than it once was after a 10 percent pay cut years back. Correction: A previous version of this post understated the money spent by "Opportunity PAC" in opposition of Armando Gomez. San Jose Inside regrets the error. It’s EZ call anyone connected to Reed put San Jose in the toilet. Why would anyone support this guy. Please read and know all the facts before you make a generalized comment. Armando has taken pay cuts so that other city employees could keep their benefits. He has worked without pay so services in San Jose would be remain uninterrupted. Not only has Armando helped city services, by taking a paycut he has helped this city buy 25 million dollars in land for the A’s, run city owned golf courses that lose millions of dollars, spend millions of dollars on legal fees for an illegal ballot measure, help Sam Liccardo siphon off millions of dollars for failed downtown projects, send city council members and the mayor on political junkets around the world, give millions in tax breaks to developers of high density housing rather than use that land for jobs, etc etc etc etc….Thanks Mayor Reed and Sam Liccardo for squandering our tax money, then villonizing the police and fire department, and thanks Armando too…..PS want the destruction of SJ to continue? If so, vote for any of the four clowns running for mayor from our current city council. During the entire “Fiscal Reform” the City of San Jose regularly reported the “total compensation” of its employees exactly as has been reported in the Gomez flyer. When the employees objected that this was misleading because a large portion of the reported figures were in fact attributable to the pension contributions for already retired employees, the City refused to publicize this fact. Indeed all city employees’ 10% pay cuts were based on the higher “total compensation” figure. Now the Mayor’s Budget Director is crying foul. Come on, give me a break. “villonizing”? That’s some new hate crime, right? Thanks so much for the correction, Bemused 365.The correct word which I should have used was “villainizing”. Should have had my morning coffee first. Thanks for reading, and thanks in advance for any further spelling corrections. The “Labor Unions” of the 21st century aren’t much concerned with labor since they know their time is up. These mob-like institutions designed to leech of its “membership” contributions have devolved into carcass-feeding parasites bent on self-preservation at any cost. btw. someone should look into a possible copyright infringement claim on the images they used for this mailer. Could someone please provide us a link to the mailer being discussed so that those outside Armando’s district can see what it says. Thanks. It doesn’t look like Armando has missed a meal due his pay cut. How many were charged on his P-card, and with whom did he dine?